Enjoy taxidermy? Yeah, me too. This project is the sick, sick work of Instructables member canida and company. 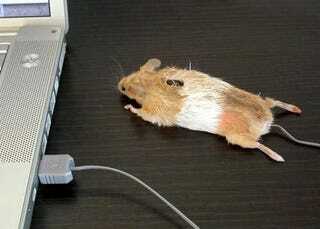 It is a real mouse, gutted and fitted with parts from one of those small laptop mice. PETA members may want to look away, or go jump off a bridge, but I'm sure the mouse died from natural causes. Hit the link below to see more pictures and a video of the mouse in action—if your stomach can handle it. At least it would go great with the beaver case mod.